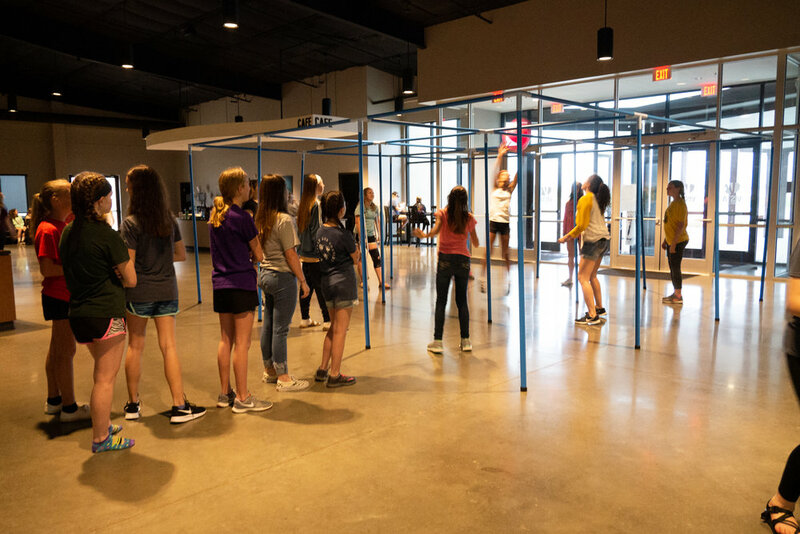 This past weekend, Vista Students held our second annual girls' weekend, In[tents] -- a two-day event for 6th through 12th grade girls to build community with one another and learn more about God. We had more than 70 girls attend!! On Friday evening, we began with worship and a message from Sydney Stolz, our Vista College Girls Intern. Sydney's talk, "Coming to Jesus", was about leaving everything behind to follow Him. She closed her message with a practice called Lectio Divina, which means Holy Reading. Lectio Divina is a way of reading scripture by breaking it down and meditating on it. The girls read Psalms 34 and then broke it down using this practice. Sydney, our Vista College Girls Intern, discussed leaving everything behind to follow Jesus. After worship, we had s’mores (YUM)! We were unable to build a fire due to the rain, but that didn’t stop us! Fire or no fire, marshmallows and chocolate are still tasty together. We closed our night with games and laughs. Indoor s'mores were a must to avoid the rain and wind outdoors! Vista Girls playing Shuffle Your Buns -- one of the favorite games of the weekend! Girls playing 9-square in the Vista Commons! One of the fun things about In[tents] is we actually stay in tents. Obviously we were indoors, because indoor plumbing is a gift from heaven. In the commons area of the church, we set up about 20 tents. It was pretty crazy but looked pretty awesome. Tents in the Vista Commons! The next morning, Jana Whitaker kicked off our day with Faith Fitness. We crammed all the girls into the Student Room, still wiping the sleep out of their eyes. While the girls danced the morning away, our leaders chugged their coffee down and made the most delicious chocolate chip pancakes for everyone! Jana leading a morning workout session! Leaders made chocolate chip pancakes for everyone for breakfast! After breakfast and tearing down of our tents, the girls gathered together for another worship session and a message from Kelsey Taylor, our Kids Ministry Associate. Kelsey spoke about giving our burdens to God. After Kelsey’s message we had the girls write down their burdens or blessings. They then tied them to balloons filled with helium and released them together. Girls praying together before releasing balloons. Chris, our Student Pastor, brought us lunch from Miller’s Smokehouse. We had all the fixins! It was delicious! After lunch, the girls formed teams for Bubble Soccer -- a game of soccer played in the safety of an inflatable bubble. The majority of the girls didn’t care about scoring or winning the game. They mostly wanted to knock each other to the ground. Finally, we concluded the weekend with our last worship session and a message from Carla Weathersbee. Carla talked to our girls about seeking rest in God. She used the illustration of Max Lucado’s "You Are Special". Lucado talks about the opinions of others and the opinion of God. When we focus on God’s opinion, the opinions of others stop mattering to us. The weekend was an overall success! My prayer for In[tents] was for our girls to experience God in a new way and build community with one another. A story that is evidence of this is that one of our girls didn’t have a Bible. We were able to provide one for her, but she didn’t know how to use it. She asked one of her friends who invited her to In[tents] to show her how to use it. So, they sat down and read the Bible together. All of God’s promises are YES and AMEN! Thank you to all the leaders, speakers, WORSHIP band, and others who volunteered their time and energy to make In[tents] an awesome weekend!